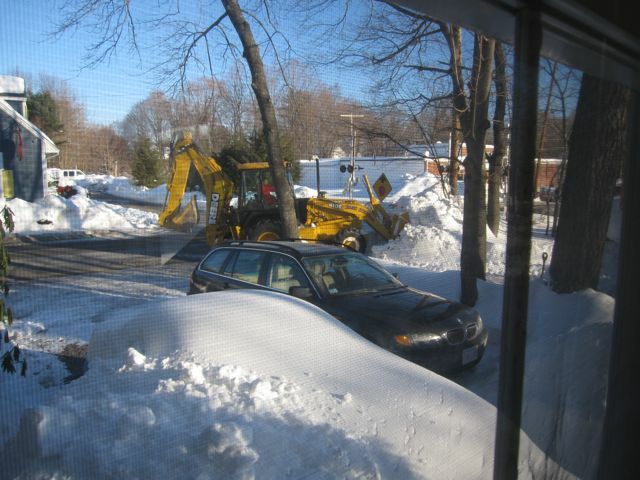 If you don't live near us, you might not know that we have gotten a lot of snow this month. Margot has had a snow day each week since the year started. We have huge piles of snow everywhere that is convenient to put them, but nowhere to put snow from the two new storms we're expecting this week. Our driveway plower came to the rescue. He rented a front-end loader and moved the piles of snow off to the side. This made for an exciting show while we ate our breakfast.